Figure A50. Lake Eyre anomaly, interpreted as the Lake Eyre slab, with (horizontal) [vertical] cross sections through (A)[D] the UUP07 p-wave) and (B)[D] the combined SL2013 and S40RTS s-wave models at 1050 km; C) the location of the modern geological record that we interpret to have formed during the subduction of the slab. 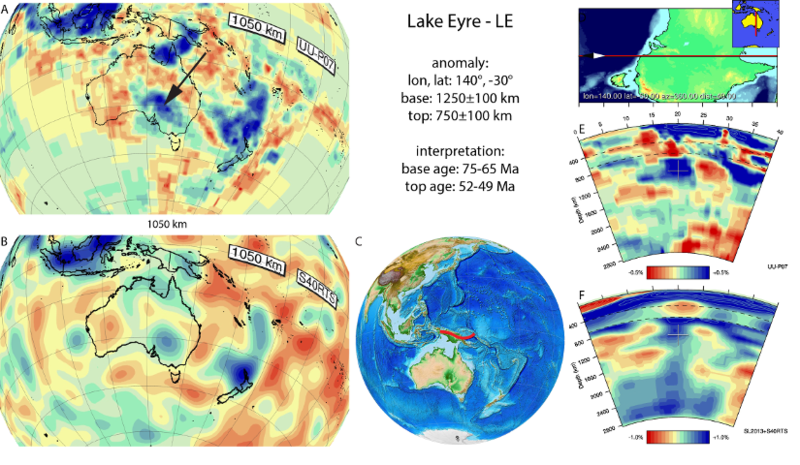 The Lake Eyre anomaly (Figure A50) was defined by Schellart and Spakman (2015). It is located at 800-1200 km depth in the upper part of the lower mantle below southern Australia. There is no record of Mesozoic or Cenozoic subduction within Australia, and pointing at a rapid northward absolute plate motion of Australia suggested by hotspot reference frames, Schellart and Spakman (2015) suggested that the geological record of subduction of the Lake Eyre slab is best sought along the northern Australian margin. Those authors correlated the slab to a period of northward intra-oceanic subduction that started ~70 Ma ago north of Australia. This phase terminated when Australian continental lithosphere arrived in the trench. Relics of the overriding oceanic lithosphere are now found as ophiolites on Papua New Guinea and the Pocklinton Trough area. The end of their emplacement onto the Australian margin occurred around 50 Ma and was suggested as timing of slab break-off (Schellart and Spakman, 2015). Subsequently, Australia moved northward and overrode the detached slab.